I’m still in London, and though I love the vibrancy of the city and the wonderful mix of people, and yes the cafés , too, I’m missing the wonderful wilderness that is north Wales, especially as today is a somewhat cloudy, yet too-humid-to-be-in-the-city type of day. But, I’ve located myself in a corner of Bishop’s Park, at the end of a path that leads nowhere and which nestles against a rather fine small lake with a myriad of ‘bullrushes’ and metre-high lake grasses growing along its sides which afford some kind of seclusion. Few venture this way because the path just ends abruptly. But for me, today, it’s wonderful. I’ve been reading for about an hour, and as I sat on a park bench under a willow tree I began to doze a little, and think about the book I was reading. The book mentioned a creature, the subject of many a story of yesteryear, told by my grandmother, and one that both intrigued me to find out more and yet made me a little apprehenive. I was very young at that time. It was the story of the Tylwyth Teg (pronounced ‘ter-loo-ith tehg’). It means the ‘fair folk’, and it was the name given to the fae, the fairies of Wales; a name given to them to placate them as they were sometimes responsible for some minor mischief. Frequenting watering areas, they were said to be small in statue, have golden hair and dress in white. When happy they would spend their time singing and dancing, especially where there was water. Like this lake! With that book on my lap, and the heat making me sleepy, my eyes half-closed, and I revelled in that half-awake and half-asleep state, not wishing to ‘travel’ too far in either direction. The grasses around the lake end swayed to and fro, some grass strands seemed distrubed by something and bent ,and returned to their almost-upright state. I could detect no animal and I didn’t want to open my eyes fully to be too analytical and come out of that liminal, half-way experience. But, no small insect could make that kind of ‘assualt’ on lake grass, either. Maybe it was the Tylwyth Teg? Ofcourse, that’s what they’re called it Wales, but they are ubiquitous and are known by different names. And, they love water – ponds, lakes, puddles and even the water pipes, sinks and showers in your house. You probably have encountered the Tylwyth Teg, or may have one in your house, even without knowing it. Signs that a Tylwyth Teg is close, according to my late grandmother, was confusion amongst people, maybe an argument starts for no reason, the loss of keys and spectacles, and just a myriad of odd happenings that are unexplained. Like long, metre-high, pond grass bending for no apprarent reason. It’s their way of having fun. Each culture in history has its creatures of the unknown, myths and monsters to avoid. To the Greeks it was Scylla and Charybdis – two mythical sea monsters noted by Homer, and to be avoided at all costs. To the ancient Jews it was the Behemoth – a sea monster of gargantuan proportions. And to the Welsh it was, or is, the Tylwyth Teg. Interestingly, have you noticed that water is a common theme throughout? In that half awake, half asleep daze, and with the heat of the day at it’s hottest, I ‘travelled’ further one way and dozed off completely. The book felt to the stone path with a thud and I woke up with a start. Nothing had changed, and yet something had changed. The lake grass was still. I had ‘jumped out’ of liminal space and time, and was back in ‘ordinary’ time (as if there is such a thing), and no one or thing was disturbing the lake side now. As I sat there, having retrieved the book, it occured to me the meaning and value of stories about the Tylwyth Teg. We live in a world, which in many senses is very predictable now that we have a vast amount of scientific data, number-crunching computers and the internet that means I can witnesss things on the other side of the planet in a second (which, when I was a child would have taken hours by wires and radio waves to arrive on the black and white tv set). And, yet there is a lot we don’t understand. Things seem to go missing around the house, upset or illness or ‘bad’ fortune just seems to come out of the ether, and its as if there’s an invisible hand at work. My grandmother, ofcourse, would say it’s the Tylwyth Teg. You may not believe in the Tylwyth Teg (or whatever they are called locally) but I draw comfort from those old stories. For they teach that however much we think we know, there is more. However much we plan, some plans will go awry. However much we want always to be happy, life has a habit of ‘kicking us in the solar plexus’ and upsettting us. We always want good news, but sometimes it’s not so good. Ofcourse, life is a mixture of events and emotions, oh but how the tough ones sting. The other lesson the Tylwyth Teg teach us is that mischevoius as they are sometimes, the can be positive and beneficial to – good and sometimes not-so-good, just like some life-events. At the end of the day, we can reason that sometimes we are not at fault. ‘Do you best, and what doesnt work out is the fault of the Tylwyth Teg’, my grandmother would say. So, who was bending that lake grass and threw my book on the stone path? Ah, a passing Tylwyth Teg, ofcourse. I’m not sure what is happening in your life right now. But sometimes, just sometimes (and discernment needs to takes place here), sometimes it isn’t our fault but a nearby Tylwyth Teg. And even then, don’t really get upset with the Tylwyth Teg, as its in their nature to be playful or mischiveous, and they’re not always like that, and what seems bad today has a habit of changing…especially when the Tylwyth Teg gets bored of being mischievous or leaves. Take heart. Things change. In yesterday’s Journal I mentioned about the imagination, and that as adults we seem to consider it a childish faculty, and that we seem to have lost that ability…or have we? ‘Children see magic because they look for it.’ Christopher Moore. – how we can take the first steps in purposefully using the imagination. there’s a free ‘three boxes’ imaginal exercise for you to try, and possibly benefit from. So, how do we use our imaginations (still)? Firstly, advertisers know how to temp us. Take holiday adverts. We see a brochure containing photographs of a sun-drenched beach, read wonderful things about it, and then over a cup of coffee we ‘dream’ of ourselves on that beach. That’s exactly what the advertisers want – you imagining yourself in that setting. Yes, you’ve used your imagination, and in a good way, and in a profitable way from the advertisers’ point of view. Secondly, when we dream when asleep, our sleeping mind is flooded with strange scenarios, smells, sounds etc. When asleep our imagination continues to function – yes, it actually never sleeps and is functioning even as you read this. But, the imagination, when we’re awake’ is ‘drowned out’ somewhat by the general busyness of the day – though it still functions, and still sways us – remember those holiday brochures?. But, when we’re asleep, and the body is immobile, and the busyness of the day is ‘a million miles away’, oh, yes, then the imaginal playground opens up and the fetters are off. Then, we revel in the imagination. The imagination, active all the time. Thirdly, there’s that half asleep-half awake realm, that we all experience, as we drift off to sleep or have ‘forty winks’. We might be conscious of our surroundings, but in our mind’s eye we might ‘see’ something in our peripheral vision, or hear something (so, I guess that should really be the mind’s ear, also). Interestingly, as an aside, it is in this state that one can experience the ‘exploding head’ syndrome’! Don’t worry- your head doesn’t literally explode, its just that, sometimes, you can be jolted out of that blissful half-sleep by a loud bang (which is ‘in’ your head, or mind). a blessing and bring benefits to you? Your imagination is a blessing, and using it more (or allowing it to ‘play’ in the background) can bring many benefits, which would hitherto not ‘arrive’. For instance, it is said that August Kekulé, the renowned chemist, and very much into the research of chemical structure, was said to have dreamed the benzine molecule’s composition, which greatly aided his (and others) research. Our imagination as it ‘plays’ allows us to ‘think outside the box’, to ask ourselves ‘what if?’ and to see things differently, and so, increased our perception. According to the American Psychological Association imagination can also enhance memory – good news for everyone, but especially those with exams. It is said to make us more empathetic towards others, and promote self-growth and maturity. Now, some may view the imagination with some distrust. This paragraph gets a little theological so if you want to skip over it, that’s okay. Some, and they still remain friends, have said to me that there are several Bible verses that speak against the imagination and the use of it, such as: Romans 1.21 and other places, where, in the King James’ Version, the word ‘imagination’ appears. But, a little research into this, shows that a more accurate rendering of the Greek word(s) is, infact, ‘understanding’, which is a different faculty altogether. In addition to this, although sometimes where the heart is mentioned it is in the negative, it is always (some might say usually) that the ‘challenge’ is in the ‘arena’ of the heart, and not necessarily the heart itself. Just a a couple of theological thoughts to show that, imagination, per se need not be frowned upon. The imagination is a spiritual faculty and resource. But, the benefits are even wilder than we first thought. Your imagination can affect your physical body. We know this can happen, for when we imagine something to be dangerous or scary (and movie-makers play on this when they make horror or thriller movies) our hearts speed up, our breathing increases, and we may feel shock or pain. There are times I’ve seen operations on tv and felt (albeit greatly reduced) some pain! I’m sure you can testify to that, too. Wilder still. A university research team did some experiments, and the findings were reported in the newspapers. It seems that (merely) imagining exercise can have a beneficial effect on muscles. This is good news to all those ‘hitting’ the gym for sport etc, as combining physical exercise with an ‘imaginal gym’ can enhance performance and give one ‘the edge’ over others, potentially. So, how had it happened? ‘The electrical stimulation test gave the answer,’ he says. ‘These results showed by the end of the month of thinking, our volunteers were using more of the muscle fibres they had always had. See this link to the newspaper article [here]. So, imagination can enhance untapped efficiency of muscles – to make them more efficient, and from those results, muscles can be up to 40% more efficient! The imagination can give physical and practical benefits. Good news for sportsmen and sportswomen, especially footballers, weight-lifters, wrestlers and those requiring strength and stamina etc, if they use imaginal techniques. How we can take the first steps in purposefully using the imagination? We can use our imaginations in many ways, and gradually build up our imaginal-prowess! Wherever you are in the ‘use of imagination’ stakes, there is always more. There are always more benefits we can access, both for ourselves and on behalf of others, as energy-workers will know. Imagination, as a link to that imaginal realm of power and potential, can feature in our prayers, good-wishes, positive-thinking, energy-working, ritual by fellow Christians and fellow Druids, and when we use the Caim [see here], when we move or unblock energy and/or bless others for healing and other positive outcomes. The imagination is a powerful tool. For sometime I’ve worked with clients using creative visualisation, imaginal-awareness, those dream-like states for their benefit in one-to-one sessions, mainly. Exercise: But, here’s one practical exercise to ‘ease’ you into this, and which may benefit you. And, during November, I’ve decided that will be a separate ministry called Liminal People. I’ve worked with some people in this area over a number of years, but now it’s time for it to separate, to come of age, with its own internet website and expand. So, Liminal People will organise one-to-one sessions in person or via the internet eg Skype, and organise workshops. Using liminality – that threshold or bridge between here and the other, and using your imaginal powers – I would (continue to) guide clients into that imaginal realm of power and potential, so they benefit. Some of my clients, in the past, have wanted to interview and ‘adopt’ an archetype (those powerful personified-attributes we all posses and which ‘power’ our skills and attributes ), others wanted to encounter angels or their animal guides, still others wanted to explore that inner world of the psyche for the purposes of growth, maturity, healing, or because they are inquisitive etc. So, how about booking a session to enter that imaginal realm, and encountering your guardian angel? Or booking in to an imaginal gym? [Remember those university research results] to complement your physical gym work? Or how about wanting to explore strange new inner places, discovering inner’ treasure’, being guided by inner companions, and more? Everything is possible in that imaginal and highly symbolic realm, and whether one prefers a poetic and symbolic imaginal realm experience, or a more prosaic one, there is room for all ‘adventurers’; and maybe, however we describe the imaginal realm it is a metaphor (and contains metaphors as symbols), a representation of something that is far too big for us to imagine at the present, and so we’re all given (different) glimpses of it. And, in entering that imaginal stream of power and potential, we benefit. That is, if we enter it. ‘Imagination is an almost divine faculty which, without recourse to any philosophical method, immediately perceives everything: the secret and intimate connections between things, correspondences and analogies.’ Charles Baudelaire. Take time to sit comfortably in a place where you won’t be disturbed for a few minutes – that’s all this initial exercise will take. Close your eyes, breath deeply and then relax. And just try not to focus on any competing thoughts. Just remain silent for a minute or two. Then imagine that three boxes appear in front of you. If you believe in angels you can imagine that your guardian angel left them here for you. If you believe in elementals, then a friendly elemental left them for you, or your companion, or the universe, or an archetype, whoever you might believe left them here for you, has left here for you. But, the boxes are in front of you. Let’s say, that you’ve had a tough day, and need encouragement for tomorrow. Then, in your mind, ask the one who left the boxes for you, to put a word or symbol or object in the middle box. A message from them to you. A positive message, a word, symbol or object for encouragement for tomorrow. And then wait. Savour the moment. Enjoy it. There is no rush. Okay, slowly open the middle box. What’s in there? A word? Perhaps typed? Or the actual sound of a word is liberated when you open the box? A picture? A symbol? An object? Slowly consider what it means. By all means lift it out of the box, if possible. There’s no rush. Explore. Take your time. Don’t forget to show gratitude by thanking the one who left the ‘message’ for you. Then, slowly you can open your eyes. That’s it. You might like to ponder upon the word, symbol or object left for you, and ascertain what it might mean. Ofcourse, this is only a basic level exercise, and there is more, much more. Other exercises might encourage you to meet to one who left the boxes, to ‘interview’ them, and interact, to visit ‘inner’ locations’, and inform you about residuality, or to meet other characters etc. Finally, as regards this exercise, if the results are confusing to you, do email me. ‘A prison is never narrow when the imagination can range in it as it will.’ Marguerite of Navarre. 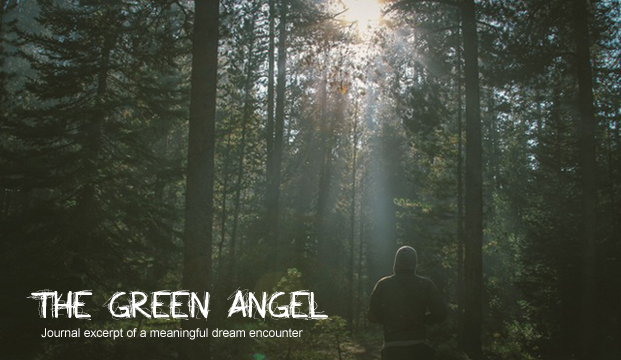 Journal excerpt: So, there was this angel, all green. Absolutely green. Green eyes, green skin, green clothes. Everything was green. So much green, that it was difficult to know where his body stopped and his unusual clothing started. He must have been about 6ft 6 inches, well over 2m high and ‘solid’, built like a wrestler. And, there he was, standing in my small inner-city garden as I looked out the living-room window. I have to admit I was somewhat confused and perplexed. A dream it may have been, but I was aware. In that dream I was thinking and reasoning to with myself, and an internal dialogue was taking place about my next course of action. The very next moment I was in the garden, and just a few feet away from the angel. He started to walk away, as if to leave. Immediately, my mind went into overdrive as I sought to delay him. The only thing I could think, was to ask him a question, to ask him if there was anything he needed. Immediately, I found myself in the kitchen, reaching for a glass and started to fill it with water. Even then, I was thinking of how to prolong this extraordinary encounter, and so I only half filled the glass. Surely, I thought, that won’t quench his thirst, and he’ll stay even longer. I went back to the angel in the garden, and he took the glass of water, and drank. He turned slightly and started to leave. Again, in my dream I was reasoning how to make the most of this encounter. I knew I had enough time, probably, only for one question. I thought to myself, should I ask, ‘Is there a God’, but I had answered that one myself – after all, here’s an angel, a messenger from God. Still moving towards the garden wall as if to leave, the angel stopped monetarily, probably anticipating my one and only question. ‘What is God like?’, I asked. He replied, ‘Love(ly)’. The reply was more of a ‘feeling’, an experience, rather than just words, and so his reply could have been ‘love’ or ‘lovely’. I like to think that in that Otherworldly, brief encounter where experiences are as important as words, and maybe, more so, that it was both of those words! And, then the angel vanished. I woke up, and over the next few weeks and months researched the Green Angel, and found that he appeared in the writings of at least two or three cultures, is a messenger of Life itself, and has an association with water, the water of Life. I recount this dream only because it meant something to me, and still means a lot to me. And would dearly enjoy hearing any of your similar encounters. There’s just a little bit more to this encounter. Timing. Some months after this dream (and it was eight years ago), I was diagnosed with oesophageal cancer and my world was turned upside down for over a year as I underwent tests, endoscopies of various sorts, drugs, chemo, radiation and a massive operation. However, tough times that they were, I took some comfort and strength from that dream. Interestingly, that dream occurred even before the cancer diagnosis. Had it happened after the diagnosis – sceptic that I was, then – I would have probably said that that dream was a natural, cerebral, to-be-expected, reaction to offset the alarming news of cancer. Maybe the product of undigested cheese! But, it couldn’t have been a reaction, nor any of those things, as it happened even before the diagnosis, even before symptoms had appeared, even before I knew that my life was about to be shook to its foundations and wouldn’t be the same again. It was almost as if this Otherworldly visitor knew that this message had to be delivered beforehand, otherwise it would have been dismissed. I couldn’t dismiss this encounter, and I’m pleased I didn’t.